The Ice Warriors is slap bang in the middle of series 5 and is one of the most loved eras of the show. It is strange then how many of the stories from that series are sadly still missing. Occasionally we get good news, the recent discovery of stories The Enemy of the World and The Web of Fear are two stories that come from that era but there are still many more stories out there, waiting to be found, I can feel it! The whole Patrick Troughton era as the Doctor has given us some of the most iconic monsters in the public eye, The Cybermen, the Yeti, The Ice Warriors, not to mention arguably two of the most important Dalek stories in their history. 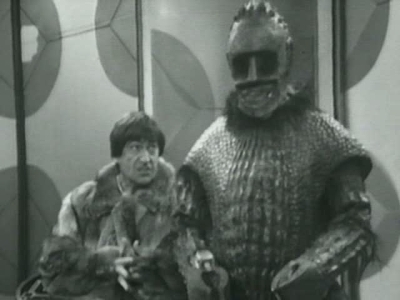 In the early years of the show when William Hartnell was the Doctor, they played around with different types of stories, we had historical adventures like The Aztecs which quickly turned into stories which gave us a grim look at the future in The Dalek Invasion of Earth, to comedy stories like The Romans and The Gunfighters. But when Troughton took over, there was only one historical story, The Highlanders before the show decided to stick with sci-fi concepts and plot tropes which, have stuck with the show for the past 50+ years. You could argue that the focus shifting to solid science fiction restricted what Doctor Who could actually do but it actually acknowledged what the viewing audience had actually tuned in too see: monsters. The Ice Warriors are a perfect example of a monster that the producers had tried to create who could be a reoccurring monster for the show since the Daleks had gone AWOL at the end of The Evil of The Daleks thanks to their creator, Terry Nation, trying to sell them to the U.S.A to get their own TV series. 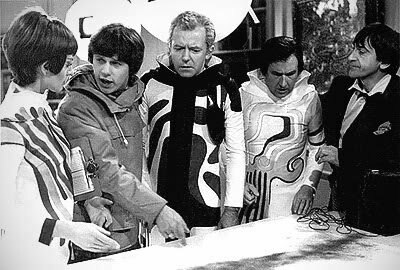 And despite the fact that they only ever appeared in four stories from the classic series, The Ice Warriors, The Seeds of Death, The Curse of Peladon and The Monster of Peladon, they were set in stone as one of Doctor Who's most iconic monsters. These towering monsters also fitted in well with another staple trope of Doctor Who at this time, the 'base under siege' scenario. The Ice Warriors gives us a nice twist on this formula with the monsters themselves not actually the biggest threat. The main villain in the story is the Earth itself and the terrain has become somewhat apocalyptic. Set sometime around the year 3000, overpopulation has ruined the planet, most plant life is now extinct and the Earth is in the middle of a new ice age which has wiped out much of the human population thanks to the blade of advancing glaciers. This story is set in what is left of Britain where a small team lead by Leader Clent work with several other likewise groups in different places around the world. With the aid of a device called the Ioniser which can melt ice, the remaining humans hope to push back the glaciers and take back the Earth. At this time in the show's history, the Doctor, played by Patrick Troughton is joined by companions Jamie McCrimmon (Frazer Hines), his Scottish friend who joined him when the Doctor, Ben and Polly visited the battle of Culloden in The Highlanders. The Second Doctor's other companion is Victoria Waterfield who was orphaned at the end of The Evil of the Daleks when the Daleks exterminate her father. The TARDIS lands outside Britanicus Base just as two fur clad burglars who look like a couple of cavemen are escaping with their loot. One of those men is Penley turns out to be one of the base personal who left to become a scavenger after a final disagreement with Clent. Penley is one of the base's most intelligent scientists and without him, the base has no chance of surviving the glaciers onslaught. The Ice Warriors or, their leader Varga, is found by a scientist Arden who, the annoyance of Clent, is more interested in archaeology than saving the world. Arden brings back what he thinks is a perfectly preserved ancient warrior to the base and begins to thaw it out. Once Varga wakes, the hissing terror played brilliantly by Bernard Bresslaw, wastes no time whatsoever in kidnapping Victoria, waking up the rest of his Ice Warriors and preparing for what he believes will be an attack from the humans. The setting for the story is brilliant but unfortunately, the majority of Ice Age Britain goes unexplored in this story as most of the action takes place around the base which has been set up inside one of the last surviving country houses and the surrounding landscape. 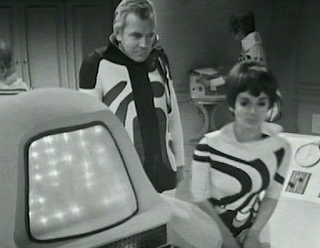 The Georgian house is also occupied by an all knowing computer which is one of the story's problems as it doesn't really do much despite many of the characters placing their futures in the hands of the machine. Penley and his friend Stor live in one of the few remaining plant museums where the pair live off of rare or extinct fruit and vegetables such as tomatoes and strawberries. Surely I couldn't have been the only person to wonder why such a collection isn't considered important enough to be under the base's protection? In fact, the place is destroyed by an advancing glacier in episode 4 and no one really makes a fuss about it besides a remark that it wouldn't be safe to stay in there. What the world would look like isn't something that is particularly from author Brian Hayles, not in the same way it is done in The Seeds of Death. Besides a few mentions of refugees being shipped off to a camp in Africa which sound suspiciously like concentration camps. It appears that Clent's base is the only building left in tact in this Britain where our entire culture has been wiped out. What was once green fields in now covered in snow and inhabited by nothing more than wolves and bears and the occasional scavenger like Stor who seem to have become little more than Neanderthals. While this world does sound decidedly bleak, there is no real insight into what life is like for those few survivors besides running around after a bossy computer! The Ice Warriors also doesn't fill out what life is like for the creatures or what motivates them besides bullying and the interests of their leader Varga who seems to think it perfectly reasonable to think that anyone he comes across is instantly out to get him. Paranoid much? Their first appearance here is a lot different to the one they put in, in the Matt Smith adventure Cold War where the Ice Warriors are elevated to one of the most noble creatures in the universe. The Ice Warriors could be compared to the Klingon's in Star Trek, their dangerous and deadly put place a high value on honour and searching for a peaceful co-existence with the other species in the galaxy, though this trait wasn't really explored until The Curse of Peladon. Hayles depicts them as cunning and intelligent but leaves them feeling a little one dimensional. But, they still make terrific monsters thanks to the decent design from the costume department about their armour and the great performance from Barnard Bresslaw as Varga. They are also particularly impressive because they have the height of about 6'7 and they tower above the smaller Patrick Troughton and Victoria. 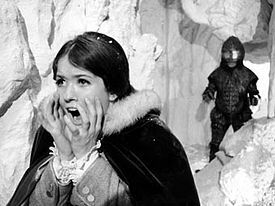 Victoria's screaming and flapping, despite a fantastic performance from actress Deborah Watling, does get old pretty quickly but one can't help but to sympathise with her, anyone would be a quivering mess if they came face to face with these guys! It is also her terror that sells one of the most exciting and effective scenes in the whole story when she is being pursued by warrior Turoc through some ice caverns as she tries to get away from the monster who looms unsettlingly in the background no matter where she goes like something out of a horror film! Although the Ice Warriors do attack the base at the end of the story it is the battle with the glacier that the humans are really worried about. In fact, it feels like the Ice Warriors are in the way. And the whole battle at the end feels a little rushed probably because they were running out of time when they were making the thing. The real conflict in the story is the one between Clent and Penley who are two sides of a coin, Penley argues that you shouldn't blindly trust a computer, which is perfectly true, while Clent shouts that you should blindly trust a computer. The whole argument seems a little too simplistic to be something that two people might argue about and it doesn't really warrant six episodes of screen time.